Over 60 experts in the field of Senior Living, Rehab, Corporate Wellness, and Government gather in Washington to address the crucial challenge of how digital technology will impact quality of life for older Americans, while changing environments, services, staffing needs and outcomes for the active-aging industry. This session will focus on the future of technology for active aging, and explores how technology will impact wellness environments and services, staff and customer expectations, engagement, and outcomes. 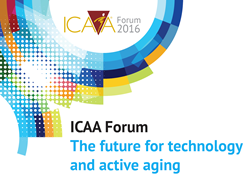 Respected thought leaders within the active aging industry will attend the 11th International Council on Active Aging (ICAA) Forum, in Washington, DC. The biannual forum brings together thought leaders from Senior Living, Rehab, Corporate Wellness, and Government, along with technology organizations, to discuss pressing issues facing the ever-evolving “active aging” industry. You can follow the day’s discussions on Facebook or LinkedIn. ICAA's CEO, Colin Milner, will also share key discussion points on Twitter. The ICAA Forum brings together thought leaders from many organizations—both private and public—to form a think tank that develops strategies to turn the challenges facing senior living providers into opportunities. Launched in 2005, the meetings forge connections among industry leaders while promoting understanding and cohesive action around the ultimate goal: health and quality of life as people age.